In the Unity forum on SCS, there is a group of stampers called the Unity Addicts, and every Wednesday they post a challenge. This week's challenge was to make a non-A2 card. So I jumped right in and made a Top Note card. And I just got this adorable penguin set Jolly Little Winter. It is soooo cute, I love it! Even if I'm NOT ready to think snow! Thanks for stopping by! Hubby's surgery is tomorrow, so pray for us if you think of it. I have some pre-scheduled posts for you, so you won't even miss me! This is sooooo cute!! Love how *springy* he is! Thinking of you and sending lots of prayers and good thoughts! Super fun Top Note card! Love your little guy...sooo cute! This is so cute! I love the little spring on the penguin! 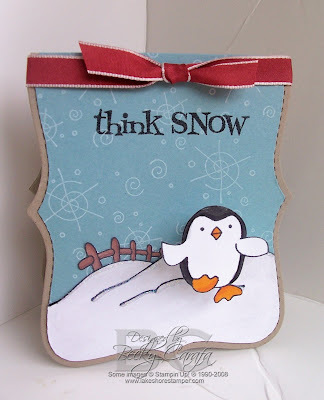 love this cute lil card, that penguin is soooo cute! Super cute. Love the dimension. I love your card! 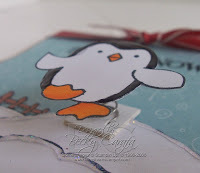 It is adorable... the penguin is so cute (I think I might have to get that set) & dont you love the top note die shape... the spring is very clever too. Cute little penguin, Becky! I hope your hubby springs back to normal quickly from his surgery! Hugs and prayers to your family! This card is so stinkin' cute, Becky!! I'll be thinking of you and hubby tomorrow...hang in there!! This is so totally cute!! Too cute card! Hope all goes well with his surgery and he feels much better soon.